I know, I know, it's been way too long since we've all met up. But I'm still over here in the states, and still don't know when I'll be coming back to the UK. Fortunately, James Yer Mam! has kindly volunteered to organise the next blogmeet. 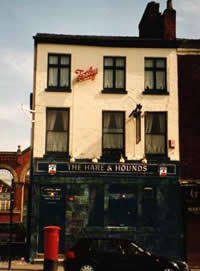 It's going to be going down at 3 in the afternoon on April 7 at The Hare and Hounds on Shudehill, a pub many of you may remember fondly from previous glittering Manchester Bloggers affairs (The quaintness of the decor! The cheapness of the beer!) For those of you who aren't quite sure where that is, it's in the Northern Quarter, just across the street from the new bus station and just across the tram stop from the Printworks. As usual, everyone's welcome: people with blogs, people who wish they had blogs but aren't quite sure how to go about setting them up, people who like to read blogs, bloggers' significant others who secretly resent being forced to attend these geekfests but haven't quite managed to get out of going yet, people who don't understand why all these loud youngsters have taken over their pub in the middle of the afternoon but hope they bugger off soon. Have fun. Added to Upcoming.org for extra geekiness. I'll try and be there, alternatively square. I'll be there - or relatively square...maybe rhomboid in shape...who knows depends on my mood. and they've been all over the place recently. One or both of us should be there (football willing...urgh). Hope you get things sorted and back for the next one! I might try to actually attend one of these things this time! Would have to be Easter weekend, wouldn't it? If I'm disorganised, I'll be there. Lovely pub by the way - any 'umm-err's out there should use exploring somewhere different as an extra reason to go.